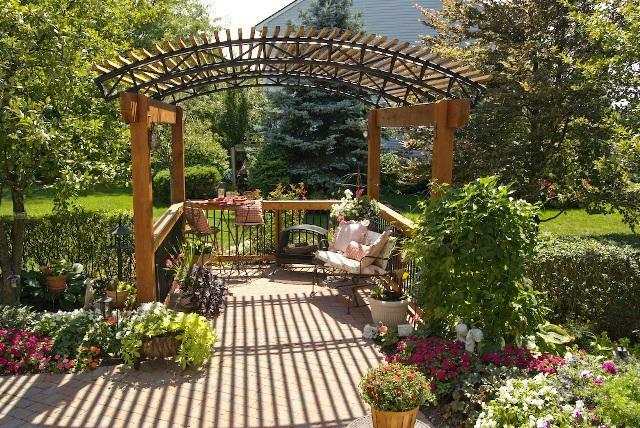 Archadeck of Columbus build a pair of pergolas for homeowners in Columbus, OH, and gives you the lowdown on pergola materials and styles. 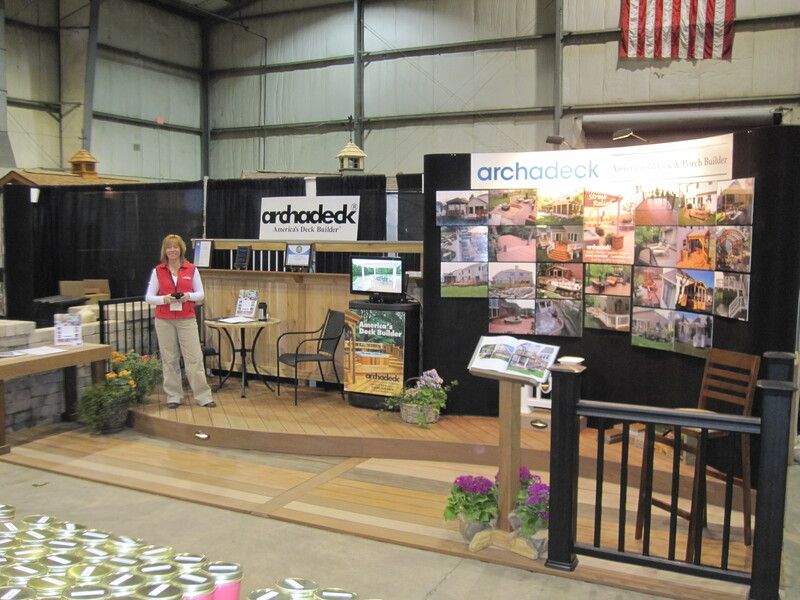 These Columbus, OH homeowners recently hired Archadeck of Columbus to install a pergola at their home. 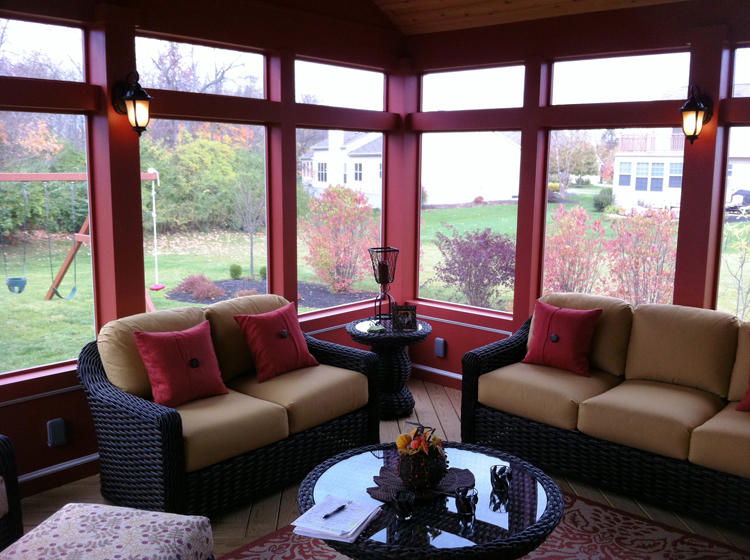 The homeowners could not decide upon one pergola design that would work for all their needs, therefore they decided upon two pergolas in order to achieve what they were looking for. 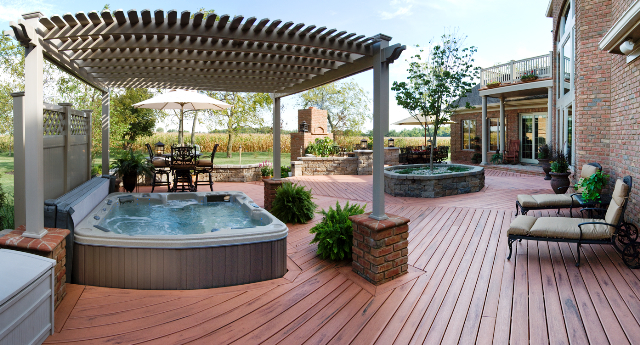 Pergolas, also know as arbors or trellises are limitless in their design. 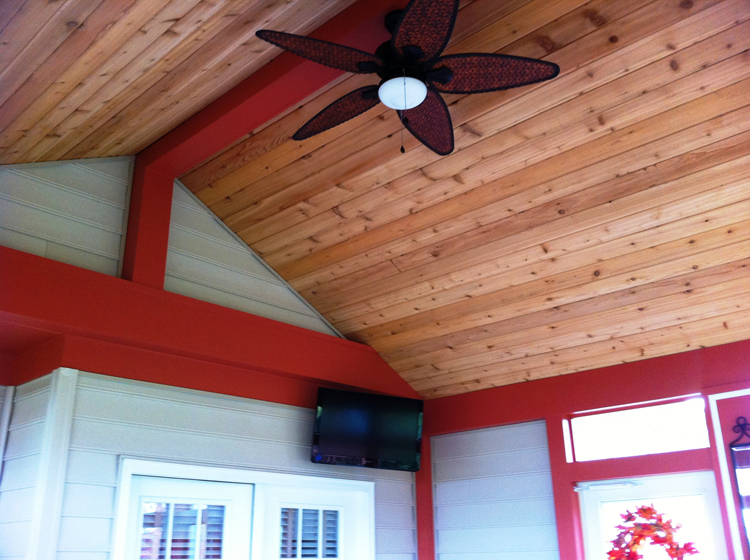 Materials such as traditional wood and cedar are options to consider when deciding upon your pergola. Treated wood moves by expanding and contracting, whereas cedar doesn’t move because of the oils within the wood itself. Cedar is more costly than treated wood, so this is a consideration you may want to think about. The components of the pergola itself come with choices as well. 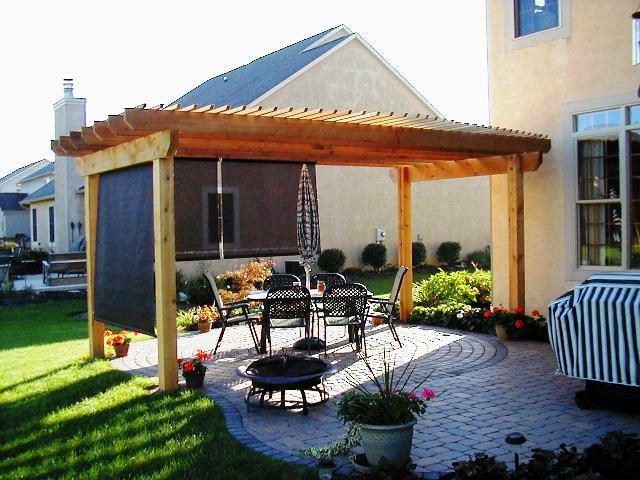 Component options all depend upon the design and look you wish to achieve with your pergola. Usually rafters are set 16″ on center, and the lathing is 2×2 or 1×4 which are typically spaced 6″ apart. In order to accommodate or gain more shade, we may add in more components to bring in further sun protection, for example we can make rafters 12″ on center and the lathing 4″ on center. 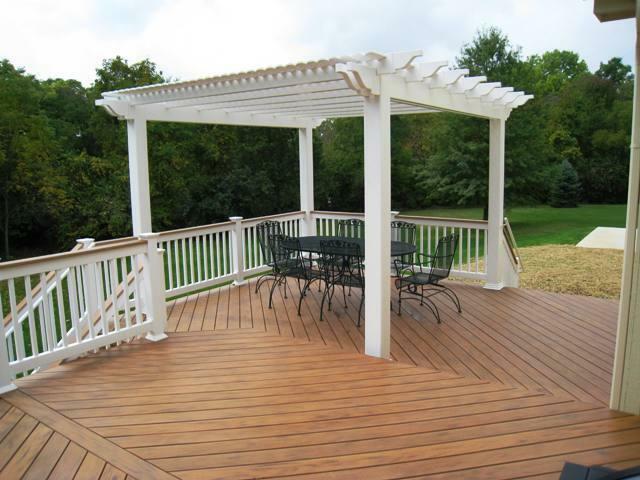 Archadeck of Columbus can construct your pergola to fit your individual needs. 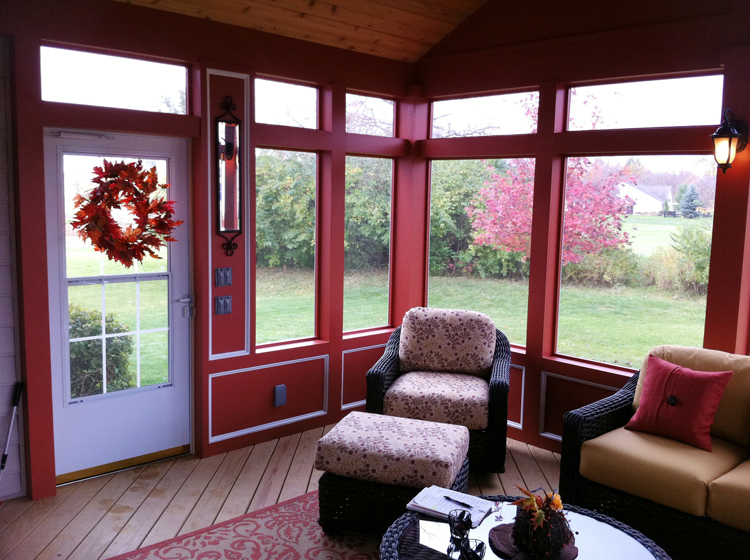 In this day and age there are also the low maintenance fiberglass and vinyl pergolas as well. 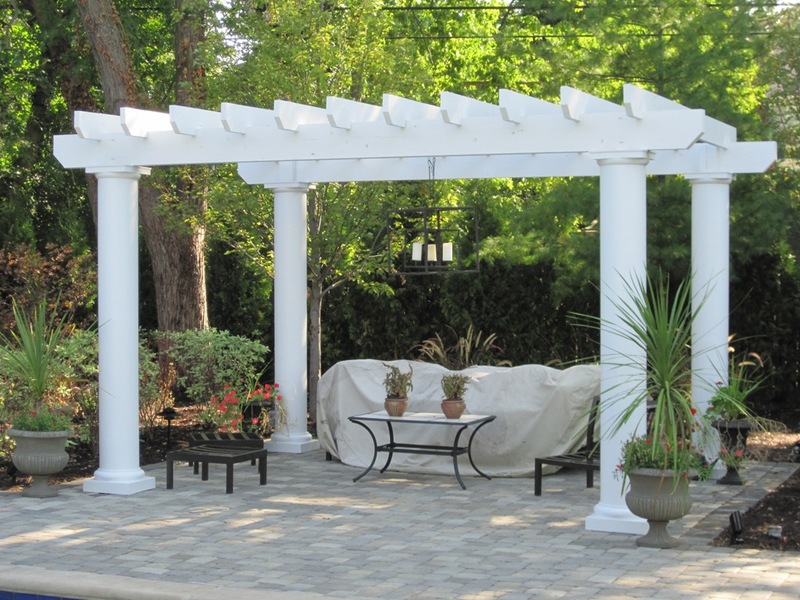 Backyard America manufactures pergola kits of fiberglass and we install these pergolas. 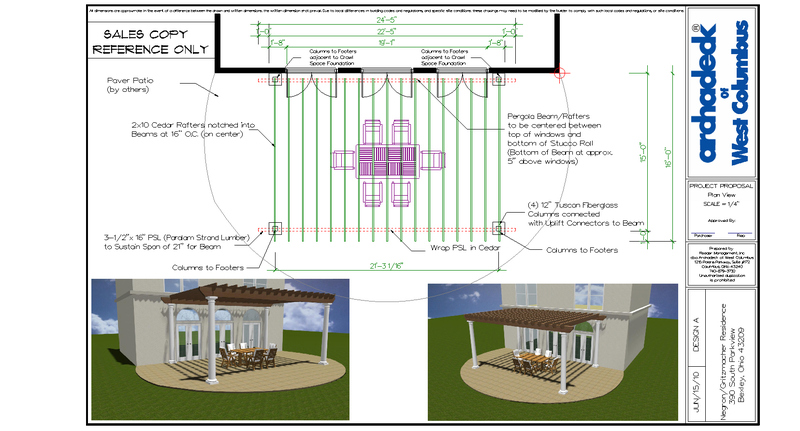 This method is another consideration to keep in mind when planning your pergola. 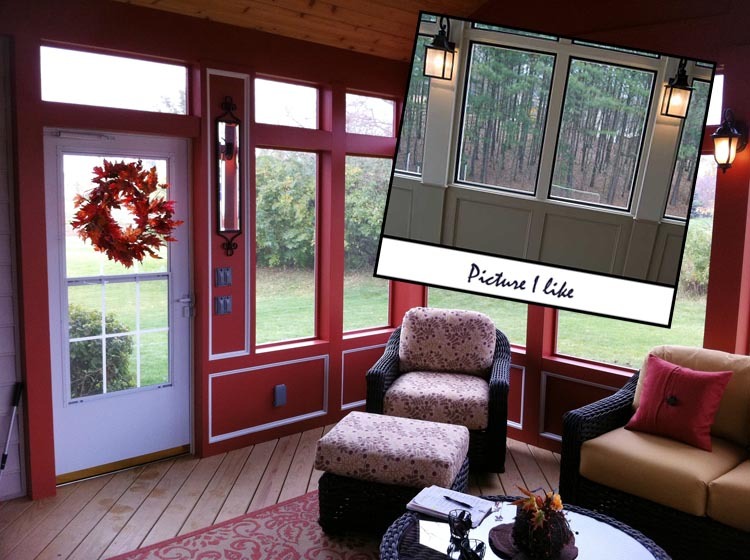 Here at Archadeck of Columbus we always supply our customers with a detailed design rendering of the outdoor structure they are considering, this way every detail is precise and to the customers approval before construction begins. 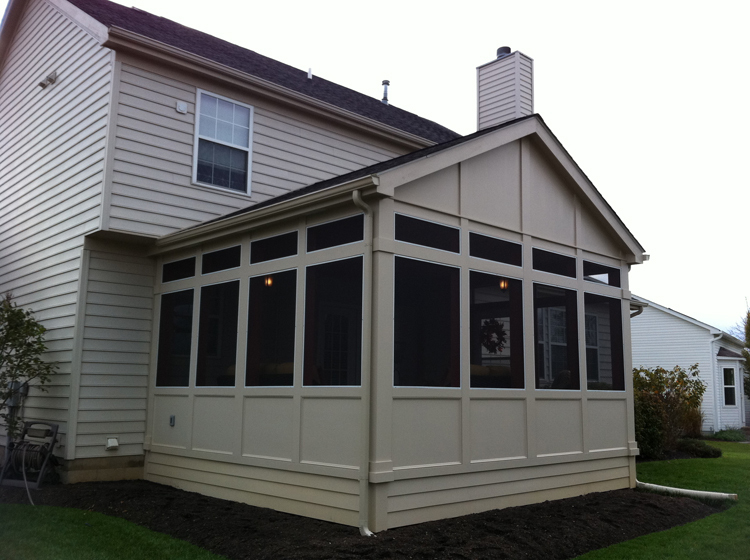 This vinyl pergola comes in adobe, white or tan. With vinyl you can have different rafter rails as well, vinyl pergolas have leuvered slats angled toward the setting sun so you’re getting more shade. 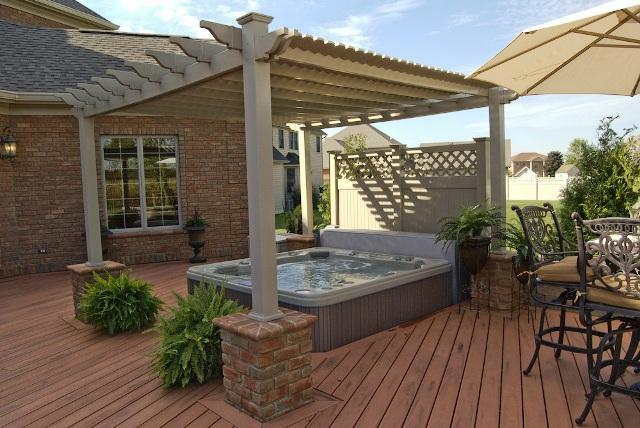 Archadeck of Columbus can also install screens (backyard blinds) into your pergola to get more shade as the sun sets. 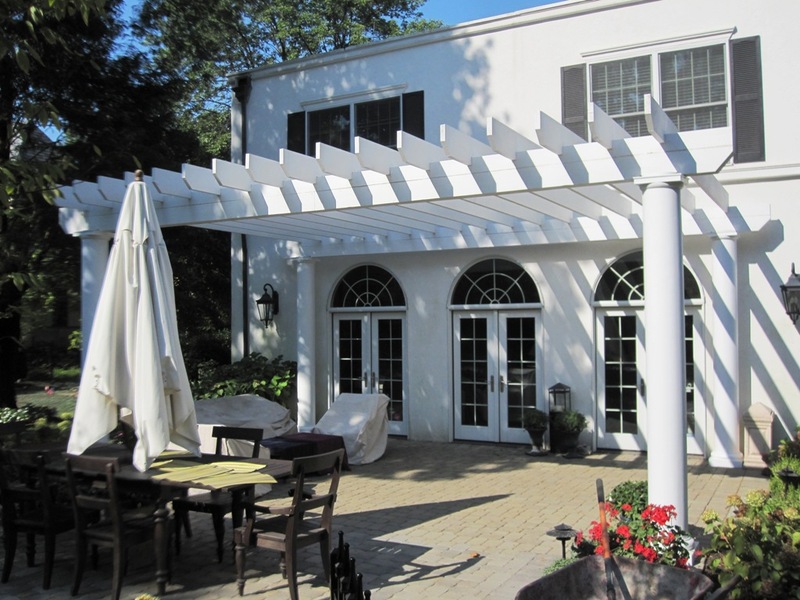 Pergolas are typically used as a shade structure or for aesthetics. This one is created to be easy on the eye. 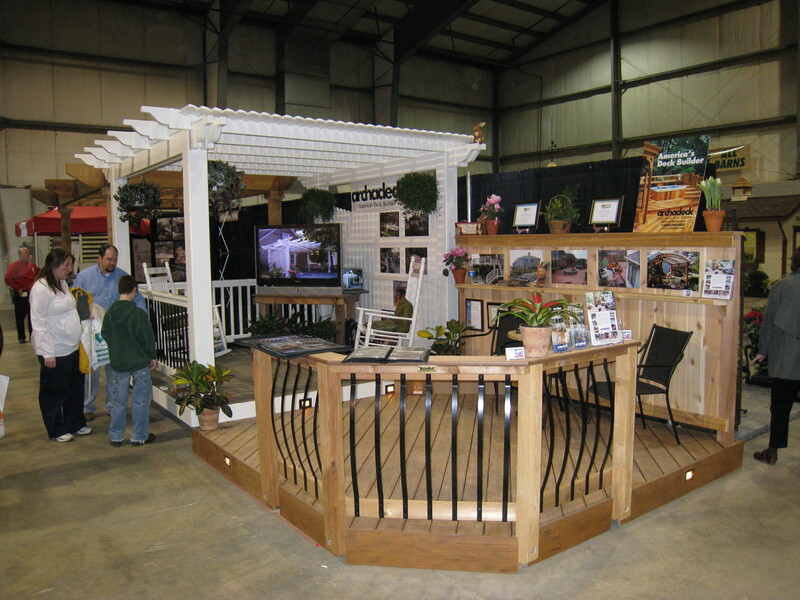 This pergola is made with custom powder-coated aluminum trusses and cedar railing with black aluminum pickets to match. 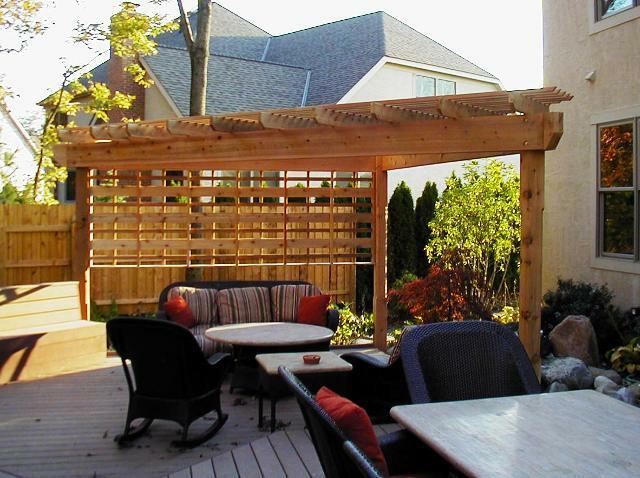 This cedar pergola is incorporated into the design of this privacy fence. It adds a perfect place to avoid the noon sun and to nurture climbing vines such as clematis or wisteria. Pressure Treated Pine – A Maintenance Nightmare? I just returned from visiting a client whom inherited a pressure treated pine deck and was disgusted with its condition. His initial intent was to tear down the entire deck and start over. He truly liked the look of wood and understood maintenance was involved but he didn’t realize that treated pine does have advantages. At the end of our meeting we agreed that removing the entire deck was not necessary and we just replace the flooring and rails. I thought it might be useful to share more information to you about Pressure Treated Pine (PTP). PTP still remains the #1 choice for outdoor structures. 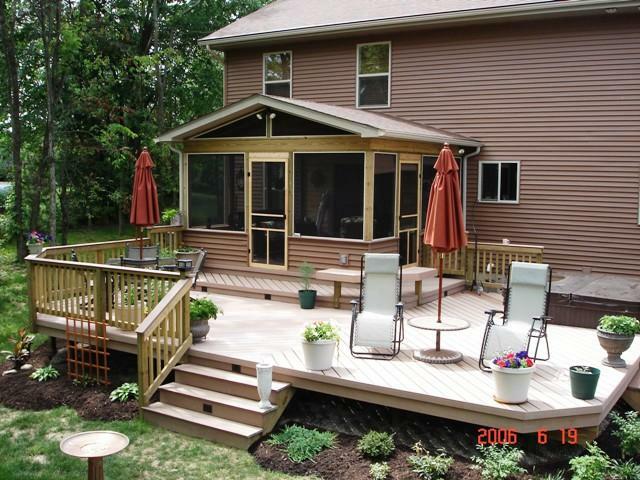 Whether used for decks, screen porches, playground sets, fencing or sandboxes, PTP is the best value for your buck. All PTP comes with a lifetime warranty against rotting (fungal decay) and termite infestation. The characteristics and maintenance of this species are integral to understanding its benefits and imperfections. The term PTP means the pine when milled is infused with chemicals to provide the warranties discussed above. The wood will essentially not rot and can be placed in the ground. The chemicals used have been changed over the last 7 years. I won’t go into that as it’s quite convoluted. The main point is the warranties provided. The main characteristic about PTP is the susceptibility to changes in temperatures, humidity and overall weather. In a nutshell this species will expand and contract based on climate conditions. Remember the sun is your enemy. The hotter its gets, the more it will expand. Ever notice decks built with PTP where the floor, rail caps or stair treads are cracking? This is a result of the sun. Ever notice how decking boards appear to “cup”. Cupping occurs as the edges of boards are stretching towards the sun in hot weather. A misnomer about cupping, it is not because the grain of the boards were placed incorrectly upon installation. It is simply a result of expansion and contraction. Another consideration about PTP, the material needs to dry for at least 3-6 months prior to sealing or staining. When first installed, most boards will be damp. This is due to the chemicals within the product. You may notice the top of the deck boards are dry within a week or two, but that does not mean the entire board is dry. Remember vaporizing (drying) goes up through the board. 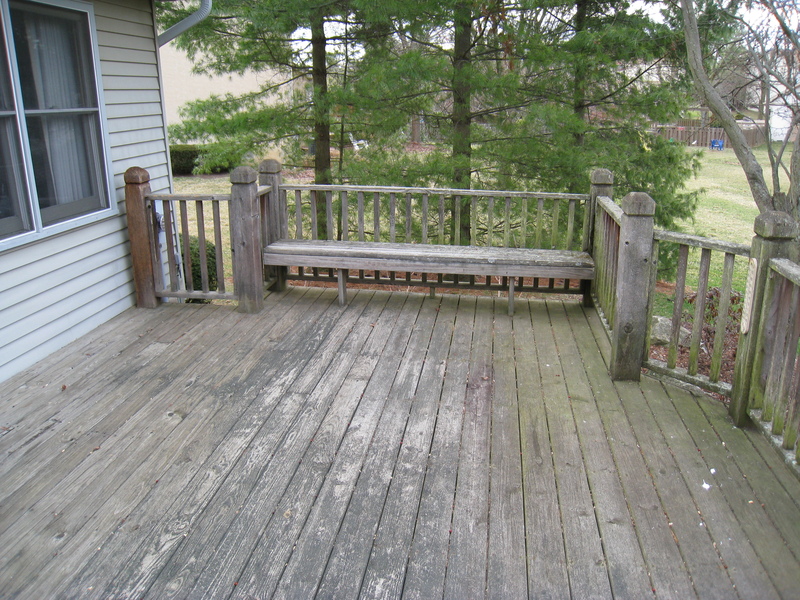 In addition, as it dries the boards tend to shrink leaving gaps between deck boards. 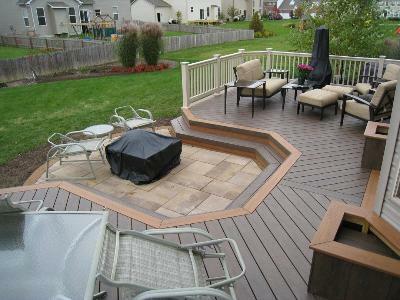 The best advice I can pass on about PTP, is to keep the deck wet in the summer months. This does not mean hosing your deck off daily, but be conscious and apply as needed. Factors such as exposure to the sun (i.e. orientation of your deck to the sun) and shade need to be considered. I would suggest keeping an eye on the floor boards. If they show signs of cracking, hose it down. Once the cracking occurs, you will never be able to reverse that trend. So keep it wet! Semi-Transparent Stains have a small amount of stain in them combined with UV protection. Lots of staining products on the market indicate claims and warranties that their particular goods contain UV protection. Of course that doesn’t take into account, normal wear and tear. This includes high traffic areas. The slight amount of stain in these products assists with deterioration. I see the best results with this method. Opaque Stains are simply a stain that will change the color of the wood. If you really like this look, go for it, but be aware that your high traffic areas will deteriorate quicker. Compare that to low traffic areas where the stain is holding up. Now what do you do? Transparent Sealers have no stain in them and just provide UV protection. Remember the UV rays are powerful and the decking will begin to turn grey, eventually. This is the easiest of methods as the “stripping” phase is less time consuming. Painting is a bad idea especially with “horizontal” surfaces. 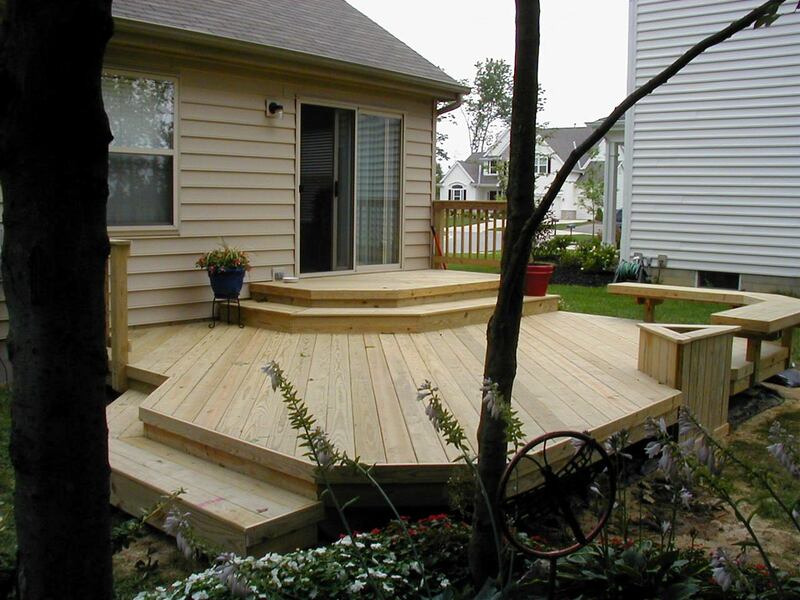 This includes deck flooring, rail caps, bench seats, planters and steps. Paint will begin to chip and deteriorate when exposed to the elements over time. Think about it, where does the water sit? If you want to paint “Vertical” components (i.e. railing posts, pickets, porch posts, that will last longer in most cases. Here are some recommendations and websites of products we have had good feedback on. The best of these products is Cabot Stain http://www.cabotstain.com More expensive than most yet remember, you get what you pay for! I have seen success with Sherwin-Williams products as well. http://www.sherwin-williams.com Lastly, I must profess, we do not provide staining or painting services as part of our business, but we do recommend an awesome painter if clients inquire. Does this all mean that PTP is awful? Of course not. Many folks still build with PTP but we want to ensure clients understand how the product will perform. If you like the look of wood, PTP is a decent option, but be aware the maintenance required to maintain the beauty. I hope this helps. Cheers! Author archadeckofcolumbusPosted on March 13, 2010 January 16, 2013 Categories Deck Builders Columbus Oh, Deck Builders Columbus Ohio, Deck Construction Columbus Oh, Deck Construction Columbus Ohio, Decks, Decks Columbus Oh, Decks Columbus Ohio, Maintenence of Wood Decks, Pressure Treated Pine, Treated Pine CareTags Care and Maintenence of Decks, Decks, Pressure Treated Pine, Treated Pine, Wolmanized WoodLeave a comment on Pressure Treated Pine – A Maintenance Nightmare?